Home » Condiments and Sauces » Tomato Jam -An Unusual Recipe! Have you ever tried Tomato Jam? To be honest, the first time I saw this recipe, I was more than a little intrigued. If you’ve followed my blog over the years, you know that I love to make fruit jams and jellies. In the past, I’ve shared this wonderful recipe for Strawberry Jam and this easy recipe for Concord Grape Jelly. What do I need to make Tomato Jam? Green tomatoes! No surprise here. Specifically, we are using tomatoes that did not have a chance to ripen. In other words, unripe red tomatoes. Sugar. An essential ingredient in most jam recipes. You can read all about it here. Lemon. By using the whole lemon, we are maximizing on taste. Honey. A little goes a long way in contributing a very distinct kind of sweetness. Water. Required to get the whole process started. As far as accessories are concerned, we need a cutting board and a sharp knife to cut the tomatoes and the lemon. We also need a large, heavy bottomed pot, a wooden spoon and a few jam jars to store our jam. A kitchen scale also comes in handy to weigh the exact amount of tomatoes we need to make these tomato preserves. Are you ready to start slicing some green tomatoes? Let’s begin by preparing the tomatoes. We need about two pounds. Rinse and pat them dry with a tea towel. Remove the core and slice about a half-inch thick. Place the tomato slices in a large pot. Next, we are going to use just half a lemon for our two pounds of tomatoes. Remove the zest and cut it into thin julienne strips. Then, slice the same half lemon into one-quarter inch thick slices. Add the lemon slices and zest to the pot along with the sugar, honey and water. Bring this mixture to a boil and then lower the heat and let it simmer for about 1½ hours. Make sure to give it a stir every few minutes or so. Notice how the jam deepens in color and the texture begins to thicken. While the tomato jam is doing what it is supposed to do, wash and sterilize the jam jars and lids. The total yield for this recipe is 2½ cups. When the jam has thickened, simply spoon into the prepared jam jars. Once the jars have cooled down completely, cover and refrigerate or freeze. Make sure to use unripe red tomatoes and not tomatoes that remain green even when they are ripe (ex. tomatillos). Total yield for this recipe is 2½ cups. Can be refrigerated for up to one month or frozen for up to three. This tomato jam makes a great addition to cheese boards. I find it almost impossible to walk out of any bookstore without a book. As you can probably imagine, the cookbook section is my favorite. A few years ago, I purchased a book called Trattoria by Ursula Ferrigno, in a second hand book store. Needless to say, I was intrigued by one of her recipes which she entitled “Green Tomato Preserve“. Growing up Italian in Montreal meant I was extremely familiar with food preservation. My parents home, like so many in our neighborhood, had a cantina. This room was dedicated to all foods that were preserved, or in the process of being preserved. The cantina was always located in the basement. You could usually find at least one reach-in freezer and a refrigerator in this area. Depending on what time of the year it was, you could find a prosciutto, a string of Italian sausage or capicollo, in different stages of being cured. This area usually had shelves upon which you would most certainly find canned tomatoes, Italian Giardiniara, home-cured olives and lupini. I could go on, but I think you get the picture. 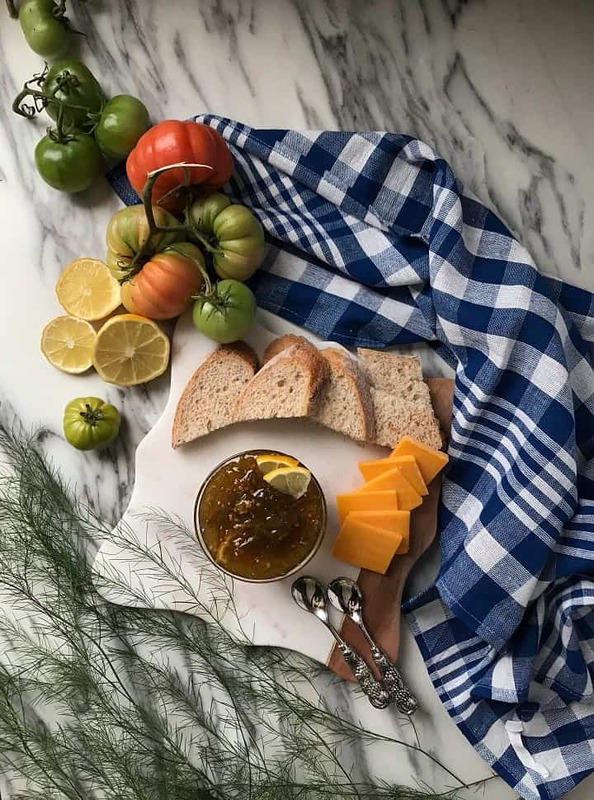 ★★★★★ If you have made this Tomato Jam recipe, I would love to hear about it in the comments below and be sure to rate the recipe! If you have ever wondered what to do with those end of season green tomatoes, make this preserve and enjoy it throughout the year. Rinse and pat dry the green tomatoes. Remove the core and cut into slices that are ½-inch thick. Place the tomato slices in a large, heavy bottomed pot. Peel the lemon zest from the lemon and slice as thinly as possible. Slice the lemon half into ¼-inch slices. Add the lemon slices, lemon zest, sugar, honey and water to the pot. Over medium-high heat, bring the mixture to a boil and then lower the heat and simmer for about 1½ hours. Stir the mixture every few minutes. Once the jam has thickened, spoon into sterilized jam jars and allow to cool down completely. Once the jam filled jars have cooled down, cover and refrigerate if using right away or freeze for longer storage period. IF YOU ENJOYED THIS TOMATO JAM POST, SAVE IT FOR LATER. PIN IT TO YOUR CONDIMENTS BOARD! I’ve had tomato jam in restaurants but have never made it myself. It is something I must try. My father, the jam maker 😉 , also makes a green tomato jam and we all love it. I have never made it, but I’m guessing it is similar to yours. Love the pictures with the different steps, and the finished product seems so delightful. Yes, I see a cheese board, and also toast, but I also see a spoon going in there and enjoying it as is 🙂 . Beautiful!